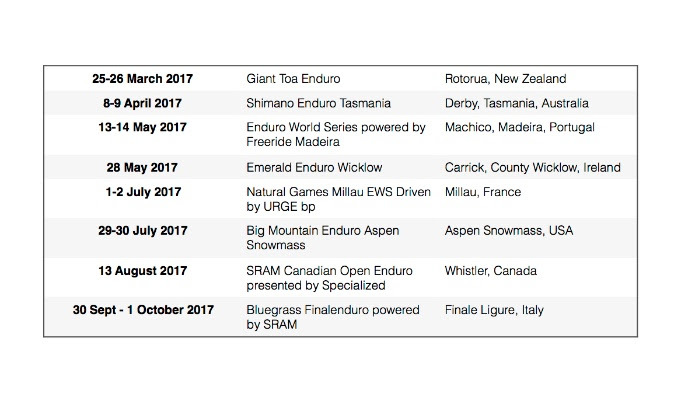 The Enduro World Series is delighted to reveal its 2017 race calendar as it continues its mission to uncover the world's best riding destinations. The new season, the series' fifth, will feature eight rounds across three continents, with the addition of three completely new and exciting venues. March will see the first competition of the year head back to familiar territory of Rotorua, in the North Island of New Zealand. Part of the Crankworx World Tour, riders competing in the Giant Toa Enduro will get the chance to once more explore this magical land filled with smoking geysers, lush rainforest and some of the most challenging singletrack the Southern Hemisphere has to offer. Round three sees the series travel north to County Wicklow in Ireland to revisit the Emerald Enduro. It's the third time the EWS will visit Carrick Mountain, which is quickly gaining a reputation as one of the wildest races on the circuit thanks to the crazy fans who line the tracks in the thousands. This one-day race has become an EWS classic and with good reason–the atmosphere can only be described as electric! It's across the pond to Aspen Snowmass for round six, the Big Mountain Enduro Aspen Snowmass. Nestled in the high mountains of Colorado, this world-famous resort is becoming as well known for its trail network as it is for its ski runs. Racers can look forward to a mixture of classic high altitude Colorado singletrack alongside some man made fun in the Snowmass Bike Park. It's more North American adventure for round seven as the series lands in Whistler and straight into Crankworx, the world's biggest mountain bike festival. The SRAM Canadian Open Enduro presented by Specialized is an annual fixture on the EWS calendar and with good reason–big crowds, big prize money and even bigger mountains in this most iconic of resorts. Where else to end the series but on the shores of the Mediterranean in the beautiful Finale Ligure for the Bluegrass Finalenduro powered by SRAM. There's a reason the series always finishes in this beautiful town in the Italian Riviera–Finale Outdoor Resort's ever-growing network of world class trails, huge crowds and the obligatory swim in the sea for whoever is crowned World Champion at this end of season extravaganza. Chris Ball, Managing Director of the Enduro World Series, commented: "The series is always trying to push boundaries and discover new riding locations adding adventure into fantastic riding, great communities and brilliant organisers, and our fifth season celebrates this ethos. The three new venues will offer riders a new experience–the islands of Madeira and Tasmania are wild and remote and will prove the gateway to some unforgettable adventures. Then the Natural Games in Millau will be the first time the EWS has been part of a multi sport festival and I'm really looking forward to seeing enduro being included in this celebration of the outdoors. The venues we're returning to are included in the calendar because they're hard to beat; Ireland, Aspen, Finale and Rotorua are all incredible riding locations and I think 2017 is shaping up to be an amazingly exciting and fun year of racing."